The primary enemies of your gum health are bacteria. Although they are always present in your mouth, they can grow rapidly when food is available for them. Thus, any leftover debris from a meal, if not cleaned with proper oral hygiene, will eventually be absorbed by bacteria and used to help them multiply. As the intruders absorb the food, some of them may begin to accumulate along the gumline and eventually seep beneath the gums. If not addressed, the bacteria begin to form pockets beneath the gums, which is the first stage of gum disease. It’s important to take heed to these warning signs because once the condition advances to the more acute stages, the damage to the underlying ligaments and bone will be permanent. The most common way of treating gum disease is to use a two-step procedure called scaling and root planing. The former involves the specialist removing bacteria from beneath the gums while the latter is the smoothing of the teeth roots, which makes it harder for bacteria to accumulate there in the future. While the scaling and root planing procedure is often used, the advancements in dental technology have provided a way to have the treatment performed in a more comfortable manner. This is accomplished by using a special laser that generally allows patients to recover faster. One reason that the percentage of Americans with gum disease is so high is that the symptoms aren’t always recognizable. Thus, it’s important to maintain preventive care visits. With a thorough examination, the early signs of the condition can be identified and treated early, which will save you time, money and limit any unnecessary suffering. These visits will also aid, tremendously, in preventing gum disease from reoccurring. 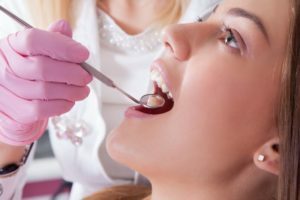 After the procedure is done to restore your gum health, the specialist may recommend that you visit more often than the typical semi-annual schedule. Instead, you may be asked to visit every three-to-four months so your oral health can be monitored. So if you suspect you have gum disease, reach out to a dentist in Philadelphia today to schedule a visit. Dr. Gary Henkel has been providing the absolute best in dental care for nearly 40 years. Still, the University of Detroit Mercy School of Dentistry graduate, has remained a lifelong learner. Thus, Dr. Henkel has received his mastership from the Academy of General Dentistry along with completing over 2,500 hours of continuing education. A member of the American Academy of Periodontology, Dr. Henkel combines his advanced training and years of experience to help patients recover from gum disease at Horsham Dental Elements, and he can be reached for more information through his website.